All original collection of studio out-takes and live recordings. What's in a title? 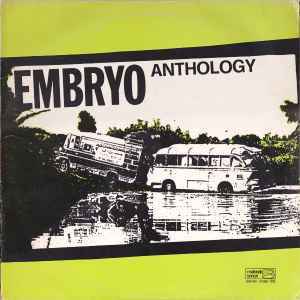 Well, I bet lots of you out there think that Embryo's "Anthology" LP is a compilation. Go on, you did, didn't you? But actually it's not, it's an all original collection of unreleased and alternate recordings spanning the first 10 years of the band. Anyway, the original LP was cursed, a lot of it was never properly mixed, the cutting was flawed and it soon disappeared. Then when they wanted to reissue it on CD the tapes had been lost. A botch-job CD called Every Day Is Okay was released (but the less said about that...). So, with a fan's dedication and the wonders of modern technology, welcome ANTHOLOGY+ with all the recordings remastered for the best sound possible, and also adding two very rare early tracks as a bonus. And, what's more it's a 100 copy numbered edition! Note: This reissue was produced from a vinyl source.